Monday, September 8th, 2008. Ryerson Theater. 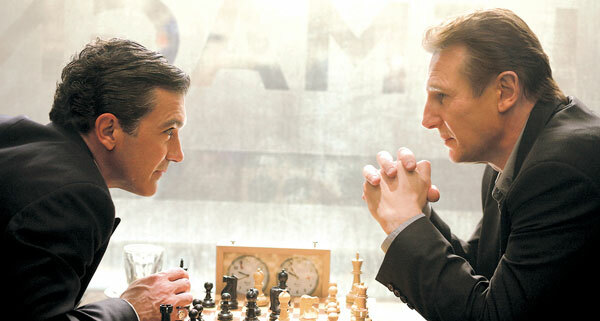 The latest effort from acclaimed director-writer Richard Eyre is a severely flawed one. Known for his most notable work in the Academy Award winning film Iris and the recently Academy Award nominated Notes on a Scandal, Richard Eyre is seen as a trite intellectual behind the camera; using many of the same techniques repetitively, but giving the film an intelligent sensation with his unique (and very recognizable) vision. Rather than bringing in an Oscar winning cinematography like in his last film, Eyre brought in stark and sleek stylings of Haris Zambarloukos. Eyre’s directorial methods worked perfectly with Zambarloukos’ feel for the camera – this being one of the few redeeming qualities of this film. When Eyre messed up, Zambarloukos shined. He had the perfect vibe for every scene. Still, it didn’t help the film from being a mess, and while Eyre did contribute heavily to this film being a success in one area, he also contributed in making The Other Man another bomb. While Richard Eyre tries to bring out the pretension in all his works, this film would just not have it. The story wasn’t a complex story until Eyre decided to mingle with it so much that the genre became unrecognizable. If Richard Eyre didn’t allow his ‘creativity’ to flood the film, it would’ve worked perfectly as a quiet thriller. Needless to say it wasn’t. He threw in ounces of romance, pounds of humor & dashes of suspense – these elements mixed were a catastrophe waiting to happen… and the catastrophe did occur. In addition to directing the film, Richard Eyre also penned the film. Based on the short story written by German Bernhard Schlink (also the source of the Kate Winslet/Ralph Fiennes picture, The Reader – due in December 2008), this convolted tale of betrayal and revenge has made its way to the big screen. The original direction Schlink took with the story was one of realism, with decepit and manipulation, and while Eyre does incorperate deceipt and manipulation into the text, he confuses the audience member far too much for it to be memorable for the right reason. This, with a ‘twist’ ending, makes for a really bizarre tale that is fleshed out incorrectly. Poorly written, too. The dialogue was ridiculous, the plotting was unreasonable and the conclusion is laughable. However, despite all the flaws the film has (more than I can count with all the bones in my body) I enjoyed the film. Knowing Eyre’s intention wasn’t to bemuse the audience (he said so pre-film) I can’t give him the benefit of the doubt on this one, but I will give him a thumbs up for entertaining me, even if it was for all the wrong reasons. The story is simple, but the writing is complex. Harry (Liam Neeson) is married to Lisa (Laura Linney). They have a daughter, Abigail who is about to get married (Romola Garai) to Mark (Laurence Richardson). Harry and Lisa are a rich couple – Harry works at an upper class business, while his wife is in the shoe designer business. They’re happy or so it seems. Lisa vanishes one morning, Harry and Abigail are in tears because they don’t know where they’re love has gone. Upon looking through Lisa’s things, Harry comes across her cell phone – a man named Rolf (Antonio Bandaras) has called and texted her many times. Harry believes Rolf is Lisa’s lover, so he goes to Lake Como, Italy (where Lisa used to go on travel) to seek out this Rolf. With a murderous and spiteful mindset, Harry goes off to kill Rolf. His daughter pleads with him to stop, but Harry is going all out. A perfectly compelling story and something many would enjoy unless someone truly dismantled the story. That could never happen, right?